Are you ready for some College Basketball? 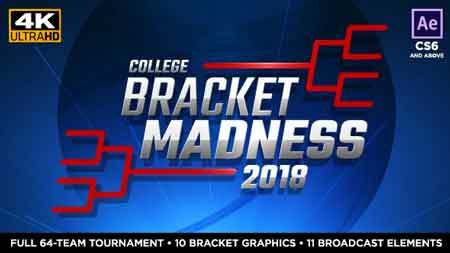 Our March Basketball Bracket Madness Broadcast Package is a comprehensive set of tournament bracket graphics, bracket screens, and broadcast graphical elements containing everything you need to cover the greatest playoff in all of sports – the NCAA March Basketball Championship Tournament! As with all MotionRevolver templates, March Basketball Bracket Madness comes with an in-depth video tutorial, walking you through the simple customization process. 100% AE! Change the colors, fonts, text, etc. Works with After Effects CS6 and above! UltraHD 4K Resolution! (3840×2160) Can be easily down-converted in standard HD1080 or 720.